Firstly, please accept our apologies, it has been over 6 weeks since our last post. Life took a busy turn, especially at work so unfortunately the blog took a back seat. However things are calming down now so you should see a more regular pattern to our posts going forward. Today we want to revisit our investment strategy. In March 2018 we discussed our investment strategy and the reasoning behind the way we have structured our investments, you can read about this here. At the time, we felt our strategy was paying off.....in February 2018 the US stock markets had suffered their biggest intraday declines in history. This period of time was very turbulent for stocks and it definitely felt like we were in for an economic shock. However, those turbulent weeks passed by, the US stock market started rising and rising and rising....on to new record highs. It seems everything is blue skies, butterflies and birds chirping....it seems nothing could go wrong. So the question for today is....Are we wrong or are we just early? Cash: Our funds are investment in online institutions such as ME Bank and Ubank. These providers have some decent interest rates of around 3%. We hold cash to take advantage of any stock market downturn. Betashares BBUS: This is a fund that basically “shorts” the US stock market. We are invested to expect a US stock market downturn. Where we expect to be invested in the next 2 years? Real Estate: Typically real estate prices stall or fall with the stock market due to the wealth effect and bank tightening lending standards. We hope to pick up a bargain as a rental investment. They look like a big fat bubble. 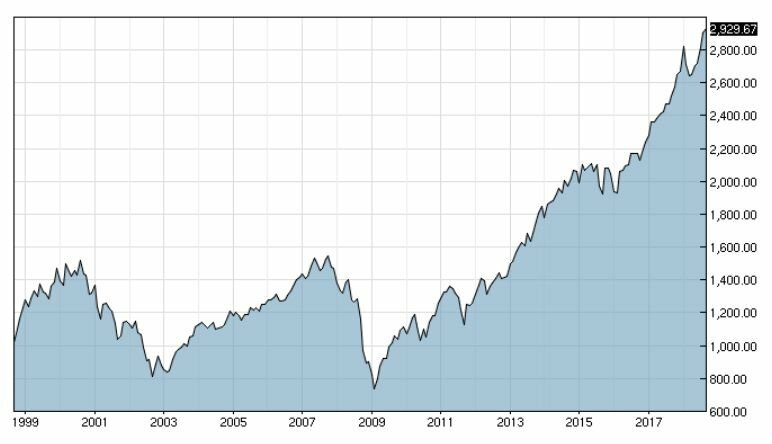 Check out the 20yr chart of the S&P500 Index. The market peaked around 1400-1500 points in 2000 and 2008 before crashing around 50% to 800 - 1000 points. We are currently sitting at 2929 points!! If the markets dropped to 1000 points again in the next downturn, that is a 65% decline!! So ask yourself what is the risk vs reward? To us, the risk is too great. We feel the stock market is way overvalued and the downside risk is far greater than any upside reward. Lets take Netflix as an example....we all love Netflix right? Netflix is currently valued at US$157 billion. If you look at the company's balance sheet, Netflix has equity (assets less liabilities) of only US$3.5 billion. So why is the market valuing this at almost 45 times equity value?? It must be huge earnings right?......well no. Netflix is forecast to make a net profit of US$1.5 billion in 2018. So the stock is valued over 100 times net profit. Lets compare this to Rio Tinto as an example. Rio Tinto is currently valued at US$86 billion. It has equity on its balance sheet of US$44.7 billion, so roughly 2 times equity value (remember Netflix is 45 times). Rio Tinto made a net profit of US$8.85 billion in 2017. So the stock is valued around a very reasonable 10 times net profit (Netflix 100 times). This is a very simplistic comparison, however it is just one example of many of an overvalued and over inflated US stock market bubble. Excess debt caused the GFC is 2008, however despite this, the world continues on its debt binge….the world had debt of US$142 Trillion in 2008 before the GFC….as at March 2018 the world had US$247 Trillion, an increase of 74%. There is only one way to go bankrupt...excess debt. Currently households, governments, central banks and companies are all in debt up to their eye balls. This will not end well. 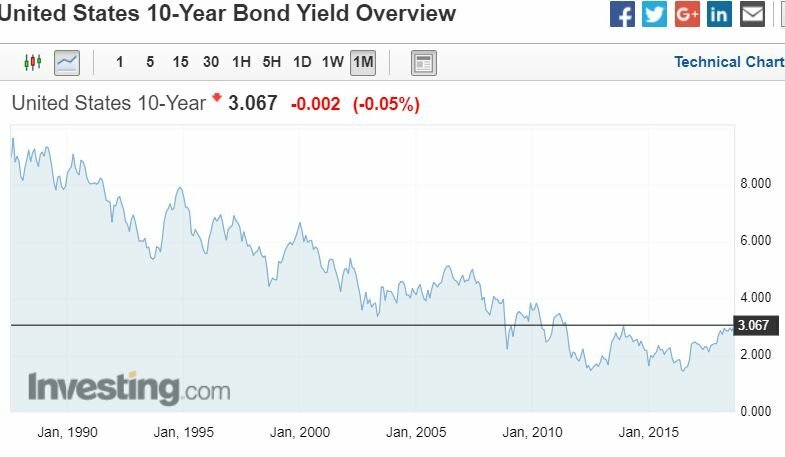 US bond yields and interest rates have been at historic lows for almost 10 years now. My bet is that once US 10 year yields go over 3.5% you will see a massive shift in investor allocations away from US stocks and into bonds. This reallocation would see stock markets drop and would be self perpetuating, pushing even more investors into bonds. US margin loan debt (when investors borrow money to buy stocks) always peaks just prior to a stock market downturn. 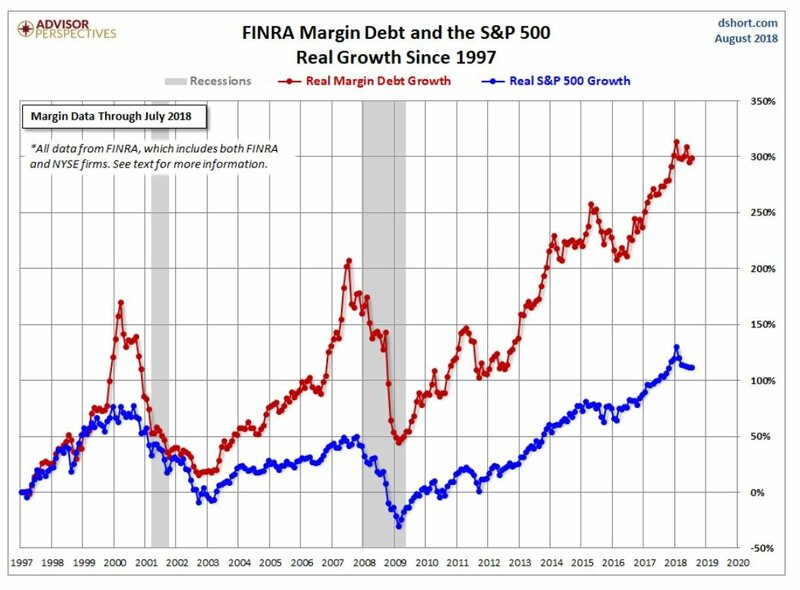 Check out the growth in margin debt below. When the market does eventually turn down, there will be a lot of indebted investors looking for the exit door at the same time which may cause a market panic. We agree with the typical financial independence investment approach of low cost passive index investing in general, however in our opinion the timing is not right to be passive. In our view, we are on the cusp of a massive financial shock brought about by excessive government spending, excessive private and public debt and unprecedented central bank intervention. The potential downside risk to the stock market is over 65%+, that is too much for us to bear. We don't mean to be the dark cloud, however we want you to be fully prepared for the market risks at play. Most people are oblivious to these factors, so hopefully at least we have given you some food for thought so you can assess your own investment strategy and review your risk tolerance. So to answer our question: Are we wrong or just early? We are sure we are not wrong, and I would rather be early than late in this case. Good luck and stay safe (financially and otherwise).